Search today's newest 212 W Washington Chicago Loop condos for sale and real estate listings in Chicago. City Center Club is a condo building located in Chicago, Illinois that offers a wide variety of amenities to fit any lifestyle. Search 212 W Washington condos for sale & real estate in 212 W Washington below. Browse our Chicago condos, lofts, Chicago penthouses and Chicago highrise condos for sale by location, size or price and let this website be your local real estate guide. We would love to be your Chicago real estate agents and assist in the condo buying process. To request more information about 212 W Washington properties for sale or to schedule a private condo showing, contact your Chicago Loop real estate experts today. Read more about 212 W Washington real estate. Looking to buy or sell a condo at 212 W Washington? Call Guarnero Group Compass, your Chicago Loop real estate team, at 312-810-6693. We are 212 W Washington real estate agents and experts on the Chicago Loop condominium market. Located at 212 W Washington in the heart of Chicago's downtown Loop neighborhood, City Center Club is a beautiful vintage building. Originally built in 1913, this 21-story high-rise was constructed out of handsome red brick in a neo-classical architectural style. Initially the Illinois Bell Telephone Company Building, City Center Club is now a full amenity loft building. Its fine craftsmanship has withstood the test of time meaning that residents can enjoy the best of modern renovations within the bones of a historical masterpiece. At City Center Club, old world charm mixes with contemporary luxury enabling residents to experience the best of both worlds. 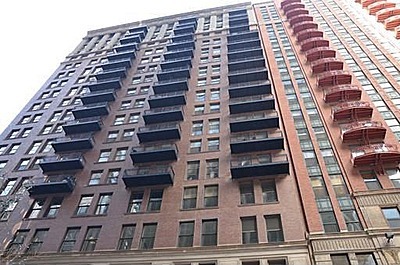 There are 183 spacious loft condominiums housed within 212 W Washington condos in Chicago. Units at 212 W Washington feature all the finest finishes discerning homebuyers have come to expect. Gourmet kitchens boast islands, 42" maple cabinets and granite countertops. Hardwood floors run throughout every unit while open floor plans and 10' cove ceilings add to the sense of an abundance of space. Gas fireplaces and custom closets are desirable features. Private balconies provide the perfect vantage point from which to soak in the stunning cityscape vistas. Building amenities include a sprawling sundeck, an on-site dry cleaner and a 24-hour doorman for residents' convenience. Additionally, City Center Club has a pet-friendly policy. City Center Club's superb location is another desirable attribute. Positioned in the heart of Chicago's financial district, City Center Club is convenient to Chicago's cultural and entertainment venues. Museum Campus and Chicago's Theater District are both within a ten-minute walk while Grant and Millennium parks are only a stone's throw away. Lake Michigan is also nearby and so, too, are terrific shops and department stores. Plenty of trendy restaurants and bars fill the surrounding streets. City Center Club provides easy access to a range of public transportation options and, importantly, is a true walk-to-work building. Buying or selling a condo in 212 W Washington? Let our team of Chicago Loop real estate agents help you through the purchase of your new 212 W Washington property or your current 212 W Washington condo. As local City Center Club real estate agents and real estate agents, we have expert insider knowledge of the market dynamics unique to the Chicago IL real estate market. We're here to work with you today! Contact Guarnero Group Compass to get more information about buyer or seller representation in 212 W Washington. Planning to get involved in the Chicago Loop real estate market? Review our CMA (comparative market analysis) form to quickly see your City Center Club property evaluation within minutes.